What’s better than adult mac and cheese? 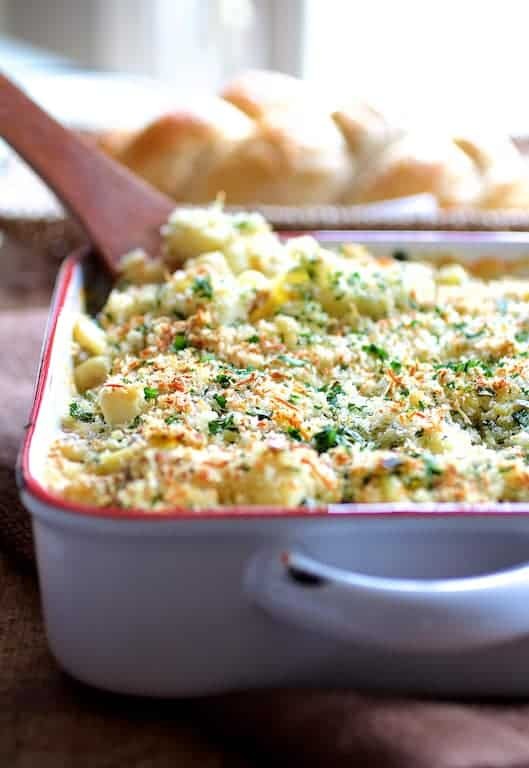 Baked Orecchiette with Cauliflower, Bacon and Taleggio is comfort food with an elegant side! When I first moved to the Memphis area a little over 20 years ago, I almost wept when I saw the selection of grocery stores in this area. This was long after the Jeremiah Tower/Alice Waters-inspired American food revolution! I mean…. Had Memphis not heard about it? My husband tried to cushion my fall beforehand and told me that when you get to Memphis, turn your clock back 25 years. Ugh. Specialty ingredients were not to be found, but I married for love and suddenly had two kids, so I tried to tell myself…. Deal with it, sister. 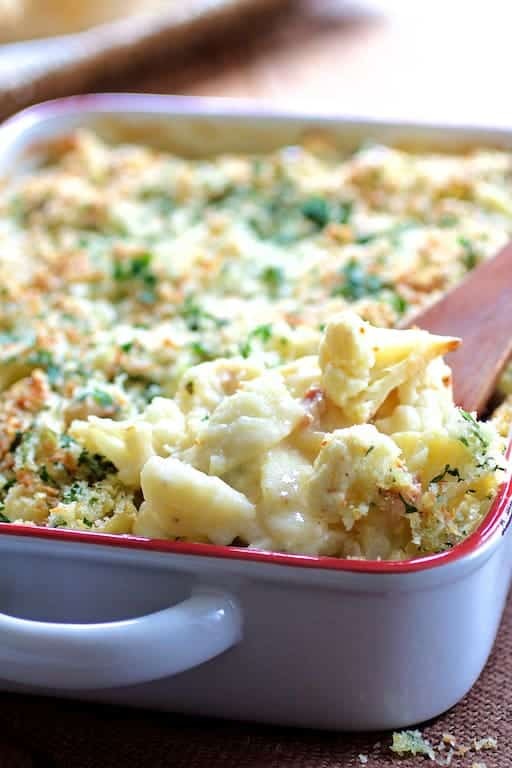 Who needs anything but boxed macaroni and cheese right now anyway? That was then. This is now. We now have amazing grocery stores and international markets popping like popcorn around here where I can find specialty ingredients such Tallegio cheese. Orecchiette with Cauliflower, Bacon and Taleggio is nothing like your kids mac-and-cheese! Regular white cauliflower is not a “specialty” vegetable, however, it’s now possible to find beautiful orange, purple and bright green cauliflower–even here! Bacon certainly isn’t new either but it’s been on a roll that shows no sign of slowing down. Here’s an ingredient that needs to have it’s day in the sun–Taleggio cheese! According to the cheese experts at Murray’s Cheese, Taleggio has been around since the 9th century. You can read the full description from Murray’s Cheese here. Does their description not make this cheese sound like it’s from the gods? Murray’s Cheese kiosks are located in many Kroger stores (which is where I found Taleggio). It’s also available at Whole Foods, Wegman’s and other specialty cheese shops and grocers. If you can’t find Taleggio, don’t stress about it–simply use brie. I could not help myself when I came upon fresh, imported orecchiette (pronounced orek-yet-tee, meaning “small ears” or “little ears”) at Whole Foods. Feel free to use any pasta shape you have around the house. I like orecchiette for this dish because it acts like a little “scoop” which holds onto the creamy sauce. This dish can be assembled up to 24 hours in advance of baking and serving. It’s going to be super cold coming right out of your refrigerator, so you may need to increase the baking time. What's better than adult mac and cheese? 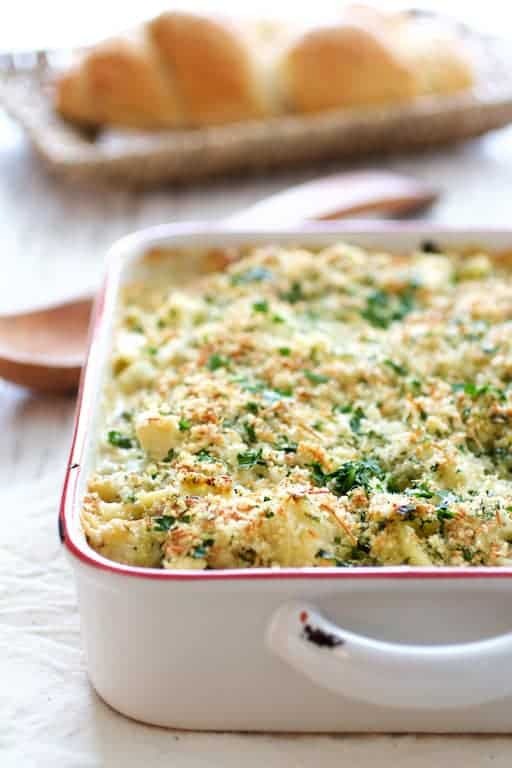 This Baked Orecchiette with Cauliflower, Bacon and Taleggio is comfort food with an elegant side! Preheat oven to 375 degrees. Brush an 11 x 7-inch baking dish with oil. Set aside. 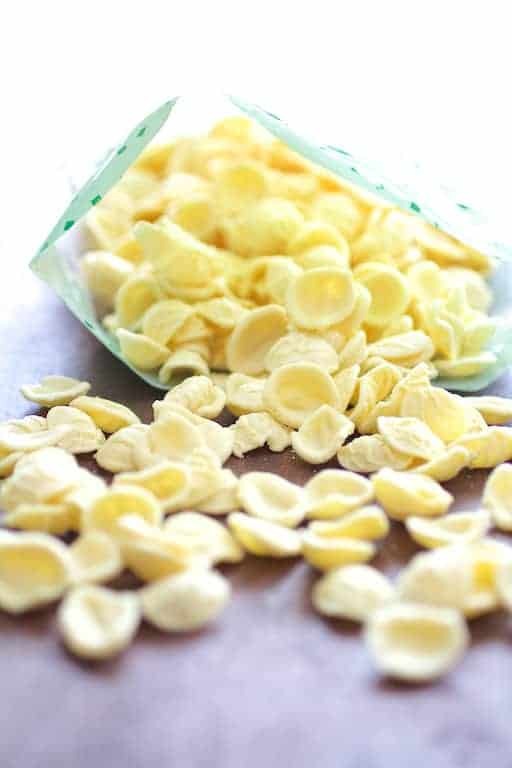 Cook orecchiette per package directions. Drain, toss with 1 tablespoon oil and set aside. Toss cauliflower florets with remaining 2 tablespoons olive oil. Spread out onto a baking sheet. Season to taste with salt and black pepper. Roast for 12-15 minutes or until just beginning to soften and brown. Set aside. Melt 4 tablespoons unsalted butter over medium-high heat. Add flour, reduce heat to low and cook 2-3 minutes, whisking constantly being careful not to brown the roux. Add the wine and the garlic, whisking constantly. Slowly add the milk, whisking constantly. Increase temperature to high, bring to a simmer then reduce heat to low and cook 3-4 minutes or until thickened. Remove from heat and add the cheese, whisking until cheese has melted and been incorporated. Season to taste with salt, black pepper and cayenne. Combine orecchiette, cauliflower, bacon and cheese sauce in a large bowl and mix well. Transfer to prepared baking dish. In another small bowl, combine Parmesan cheese, panko, remaining butter and parsley. Sprinkle over pasta. Cover with aluminum foil and bake 25-30 minutes. Remove foil and continue to bake until crumb topping is turning golden and sauce is bubbling--approximately 10-15 minutes. Let stand 5-10 minutes and serve. Assemble up to 24 hours in advance and refrigerate. Let stand at room temperature for 30-45 minutes before baking or increase baking time. Pasta being my one, true love, I am totally trying this one with this dish! 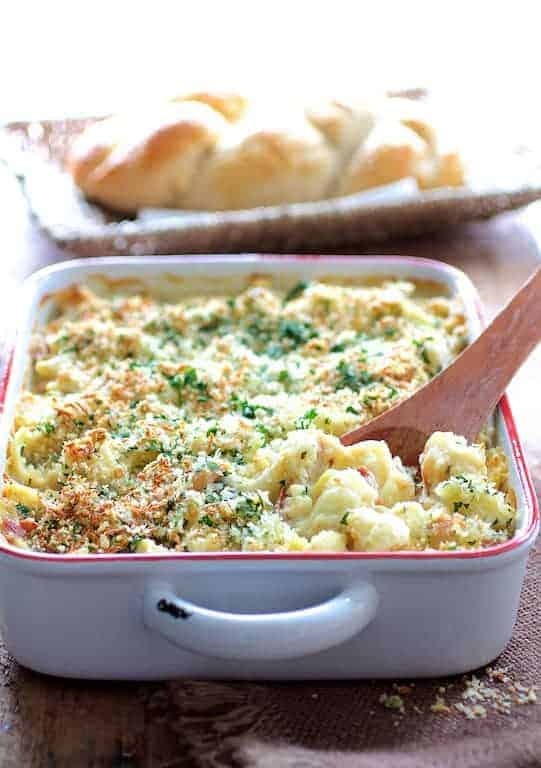 Bacon, cauliflower and 9th century cheese all in one dish sounds like something delish! Hope it comes out as pretty as yours! Thanks, Rebecca! Let me know how it goes! This looks delicious! My kids, especially, would love this!!! Printed, can’t wait to try! Thanks, Maria! Hope they enjoy! This looks amazing, anything pasta is good by me. On my to make list. Haha, Carol I could be talking about myself, same thing only in Italy. And now stores are bigger, a lot more variety. But when I go home I still spend a lot of time in grocery stores with my mouth open. LOL. I hear ya! Such a crazy foodie existence one lives when one lives to visit cool markets and grocery stores! That looks so good, Carol! 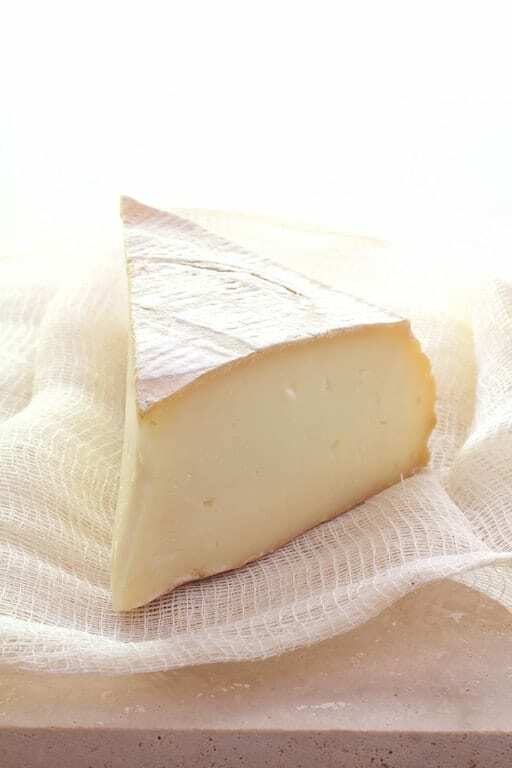 Taleggio is fantastic when melted, it has that pungent distinctive flavor that pairs well with vegetables. Love that you used orecchiette, not very many know how good they are 🙂 . Nothing beats great grocery stores!! It is so nice to find high quality ingredients locally! And this–YUM!! !